Warm Up With Hot Buttered REDRUM Inspired by “The Shining”! Peanut Butter Filled Critters Eggs for Easter! Perfect SCAREamel Apples with Nostalgia Electrics Caramel Apple Party! Twilight Zone Mystic Seer Candy Box Printable for #TwilightZoneDay! Your brain-shaped gelatin mold can be used for much more than just gelatin and desserts! Scare Up Your Table with a Brain Macaroni Salad! Your brain-shaped gelatin mold can be used for much more than just gelatin and desserts! A couple of years back I showed you how to make my Maggot-Infested Brain Shrimp Cocktail, and now I have another recipe to share just in time for the Season 5 premiere of The Walking Dead on Sunday, February 8, 2015 – a Brain Macaroni Salad! Make this as a side dish for your premiere party, or any other time you need a little extra zombie food on hand for your undead loved ones. Feel free to customize the vegetables and additions to your liking. I prefer my macaroni salad to have dill pickles and olives, but added chopped orange bell pepper this time for a little variety. The secret ingredient to making this recipe work is by substituting part of the mayonnaise with cream cheese – when the macaroni salad is fully chilled, it helps to hold it together in the brain shape. 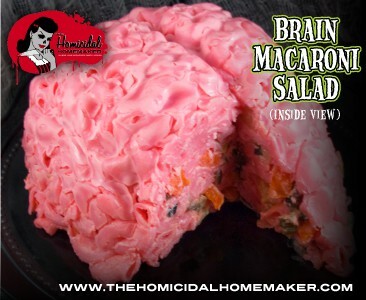 EDIT: There is a new variation of my Brain Macaroni Salad recipe on my horror cooking show. View the recipe here. Fill a large pot with water and lightly salt; bring to a boil. Add food coloring and stir until dissolved. Add the elbow macaroni and cook until al dente. 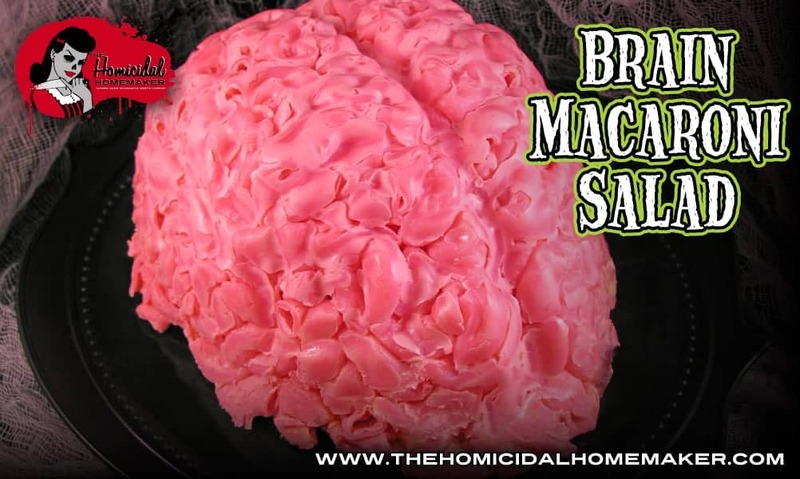 While the pasta is cooking, lightly spray a brain-shaped gelatin mold with non-stick cooking spray. In a separate bowl, mix together the softened cream cheese, mayonnaise and mustard. Add enough food coloring to closely match the shade of the dyed pasta mixture. While the macaroni is still warm, add to the dressing mixture and mix until full coated. Using a spoon or spatula, start building a thin layer of macaroni against the sides of your mold. This is so you won’t see any of the mix-ins on the outside of your mold. Of course, if this isn’t important to you feel free to skip this step. Add the pickles, olives, cheese and pepper (or mix-ins of your choice) to the remainder of the macaroni/dressing mixture, spoon mixture into mold. Lightly press down to compact it into the mold. Cover with plastic wrap, and refrigerate until firm (6-8 hours is best). To unmold, use a spatula to gently release macaroni salad from sides of mold. Place a plate on top of the mold, and flip over. Gently shake the mold (while holding the plate with your hand underneath) until the salad comes loose. Help support this site! Become a patron for as little as $1/month! Can't commit monthly? Please consider making a one-time donation on my Ko-Fi page! Next articleTurn Boo Berry into Monster Cereal Milk Popsicles! Hi! I'm Kaci, more commonly known as The Homicidal Homemaker. I started this website to inspire others to bring a spooky element to every day life through horror recipes, cocktails, crafts, & tutorials. Check out my recipes in every issue of Rue Morgue Magazine, and my horror cooking show on Screambox, YouTube, & AT&T Uverse/Comcast in Central CA. All Work & No Play Makes Me Want to Bake…The Shining REDRUM Roll Cake! The Nightmare Queen: a Vegan Take on Burger King’s Nightmare King! Get Chilled to the Bone with Blood Orange Morgue-aritas! The Homicidal Homemaker is your source for the best in horror food, horror recipes, horror crafting & DIY tutorials, spooky cocktails, product reviews & more! Exclusive recipes featured in every issue of Rue Morgue magazine and episodes featured on Screambox. Unless noted, all photos/recipes are protected by copyright. My images, ideas, and templates aren't intended for profit or resale, so please don't use 'em for any commercial purposes. Scaring...I mean, sharing is caring and is always appreciated; thank you! © Copyright 2008-2019 The Homicidal Homemaker® - All rights reserved. No content may be redistributed, copied, or modified without express written permission. No recipe/tutorial may be used for profit or commercial use. S​ign Up for Updates from The Homicidal Homemaker! ​Be the first to know about new contests & giveaways, new recipes, tutorials, and more!